Viking 1’s image that started it all in 1976. “Area on Mars could hold fossilized remains of life”,1 “New Fossil Evidence for life on Mars?”2 or even more optimistically, “Scientists identified signs of life on Mars”3—In a prime example of hyper-sensationalism in journalism, these headlines describe not a cosmic archaeological dig, but the discovery of mineral-rich clay rocks on Mars in a region called the Nili Fossae. So what is it about this Martian clay that has these journalists practically proclaiming the discovery of fossilized ET? According to the reports, it has some similarities to a region of Australia “where there was buried and preserved evidence of ancient life on earth.” “Scientists” and “experts” think that this discovery warrants close examination of the area to see if there are also fossils there. Of course, fossils are only formed where there is life to begin with, and there is no evidence that there is or ever has been life on Mars. Indeed, one of the articles is forced to admit that “The study does not offer actual evidence of past life; rather, it suggests a place that might have been habitable.” This is similar to claims of that extraterrestrial life on other planets was almost a given due to the alleged discovery of ‘earth-sized’ extrasolar planets. See Hosing down the hype. Of course, fossils are only formed where there is life to begin with, and there is no evidence that there is or ever has been life on Mars. Mars has been searched for life possibly more than any other celestial object. As far back as 1877, Italian astronomer Giovanni Schiaparelli saw thin dark lines on Mars, and by 1908, the American astronomer Percival Lowell claimed that he had found hundreds of canals which could have been carved out by intelligent inhabitants. 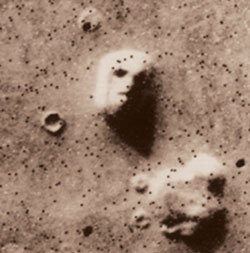 But in 1976 the Viking spacecraft failed to detect any sign of life although some pundits claimed that Viking’s photos revealed a ‘face on Mars’, which was ‘proof’ that advanced alien civilizations once lived there. 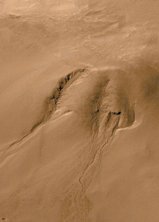 However, later pictures taken by the Mars Global Surveyor and the Mars Express expeditions revealed that the structures were nothing more than naturally forming geological formations, which when photographed at a certain angle appeared to resemble a face. No liquid water has been found on Mars. Nevertheless, there are intriguing signs that suggest recent flows of liquid water, like the image at left. Photographed from space, this geologic feature shows patterns strikingly similar to those found on Earth resulting from flowing water. The gullies comprise a deep channel with an ‘alcove’ (collapsed area) at the top end; and an ‘apron’ at the other end, comprising debris apparently transported down the slope. ‘They could be a few million years old, but we cannot rule out that some of them are so recent as to have formed yesterday.’—Dr Michael Malin, Principal Investigator, Mars Orbiter Camera. In 2001, NASA claimed that Mars may have once had an abundance of liquid water—something that most would believe is absolutely necessary for life to occur. Not only that, but news reports claimed that massive volcanism in the past may have produced a “Noachian” event, which would have produced enough water to cover the planet to a depth of 400 feet, though much of the water would be lost to space due to the lack of an atmosphere on Mars.4 We have often pointed out the irony that scientists have no trouble accepting a global flood on a planet that does not have a drop of liquid water, but not on a planet that is 2/3 covered with water (the earth!). Even the simplest forms of life (bacteria) contain massive amounts of information that point to an intelligent designer. The preoccupation with extraterrestrial life has evolutionism at its core. It’s ironic that millions and even billions of dollars are being spent in the hope of seeing evolution occur via a few microbes on other planets. Yet, the biosphere of Earth is abundant with an incredible variety of living organisms, and they still can’t work out how it happened here. www.msnbc.msn.com/id/38494792/ns/technology_and_science-space, 9 August, 2010. Return to text. newsfeed.time.com/2010/08/02/new-fossil-evidence-for-life-on-mars, 9 August, 2010. Return to text. momento24.com/en/2010/07/31/scientists-identified-signs-of-life-on-mars/comment-page-1, 9 August, 2010. Return to text. Reuters, Mars Calamity May have Created Conditions for Life. New York Times, 16 March, 2001. Return to text. “Astrobiology,” <www.origins.jpl.NASA.gov/astrobiology/astrobiology.html>, January 31, 2003. Cited in Bates. G., Alien Intrusion: UFOs and the Evolution Connection, Creation Book Publishers, Powder Springs, US, 2010, p. 33. Return to text.